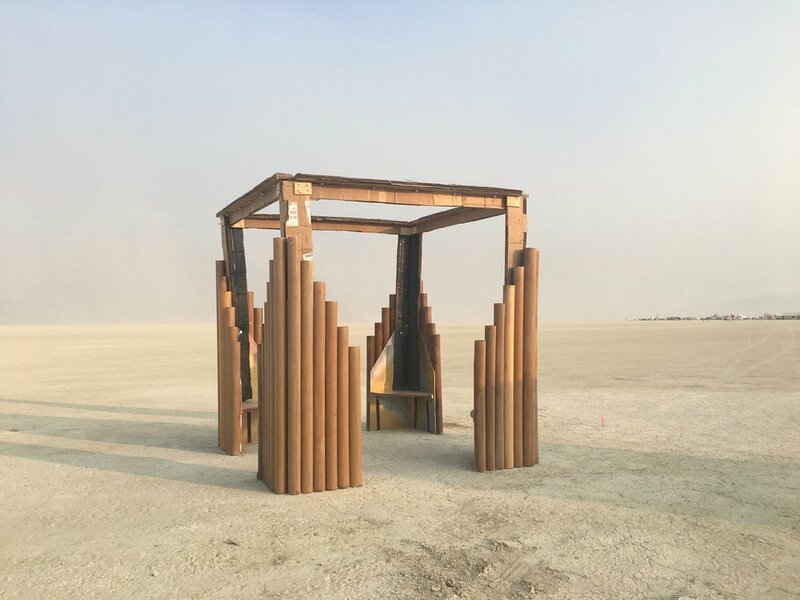 We are fantastically proud to introduce 'Vox Nihili', a sculptural installation we are presenting at Burning Man 2018. Designed and fabricated by University of Edinburgh students, (two artists and an engineer) the structure is fully sustainable: constructed of recycled and reinforced cardboard. This year's Burning Man theme 'I, Robot' explores the mystery and exoticism associated with Artificial Intelligence and future technologies. We are captivated by engaging in this zeitgeist of creativity and technological innovation. Through this huge quasi-science fiction theme, we have been working to explore and produce creative motifs in our own language. It is the meeting of science fiction and spirituality, combined with the intrinsic mysticism of machines that sparks our interest. We are responding to modern technology through drawing upon the diverse cultural history of our team. Looking back to the extravagance of Baroque Rome and medieval England; we sought out architecture and iconography we could deconstruct and reconfigure for the modern age. We are responding to Burning Man's call to arms! Making art outside the bounds of the institution, we are collaboratively constructing an installation for the community. But to do so.... we need YOUR help! We are sustainably sourcing cost-effective materials, however transportation costs are our main obstacle. We need to rent a large vehicle to drive from our making location of Santa Barbara to the Black Rock Desert of Nevada. Additionally we need help in purchasing tools and materials to secure our art installation in the harsh desert conditions. We are in the process of submitting our designs for final approval ensuring our structure is safe for the community at Burning Man. Once this is done we can progress into the final design phase and complete our logistical plans. However, this will all only be possible with your help. Viva Arte Viva: A Biennale for an Outdated Future? Impkater Magazine, 23 June 2017 http://impakter.com/viva-arte-viva-biennale-outdated-future/.